This album is the first in a series of nine covering the complete works of Thomas Tallis (c1505-1585). Not for nothing is Tallis known as the 'father of church music'—with his colleagues at the Chapel Royal he created most of the church music genres that we take for granted today. 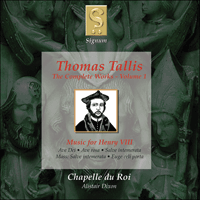 Volume one in the series of nine contains much of the music that Tallis wrote during the reign of Henry VIII. The two early votive antiphons Ave Dei and Ave Rosa open the album and it concludes with one of Tallis's masterpieces Salve Intemerata. Unusually for an English composer of the time, Tallis wrote a "parody" mass based on material from Salve Intemerata. Also included are two beautiful miniatures not previously recorded—Alleluia: Ora pro nobisand Euge celi porta. This was the first album to be recorded by Chapelle du Roi and was Signum Records' debut album in February 1997. ‘Tallis is dead and music dies’. So wrote William Byrd, Tallis’s most distinguished pupil, capturing the esteem and veneration in which Tallis was held by his fellow composers and musical colleagues in the sixteenth century and, indeed, by the four monarchs he served at the Chapel Royal. Tallis was undoubtedly the greatest of the sixteenth century composers; in craftsmanship, versatility and intensity of expression, the sheer uncluttered beauty and drama of his music reach out and speak directly to the listener. It is surprising that hitherto so little of Tallis’s music has been regularly performed and that so much is not satisfactorily published. This album is the first in a series of nine which will cover Tallis’s complete surviving output from his five decades of composition, and will include the contrafacta, the secular songs and the instrumental music—much of which is as yet unrecorded. Great attention is being paid to performance detail including pitch, pronunciation and the music’s liturgical context. As a result new editions of the music are required for the recordings, many of which will in time be published by the Cantiones Press. This recording, the first in the series devoted to the complete works of Thomas Tallis, includes church music written during the first decade of his career, probably between about 1530 and 1540. Relatively little is known about Tallis’s life, particularly about his early years. He was probably born in Kent during the first decade of the sixteenth century. When we first hear of him, in 1532, he is organist of Dover Priory, a small Benedictine monastery consisting of about a dozen monks. We do not know whether Tallis’s duties were restricted to organ-playing, or whether he also had the opportunity to work with professional singers. The more affluent monastic houses of theperiod certainly endeavoured to participate in the fashionable cultivation of elaborate church music by employing a small choir of professional lay singers; such a choir, which was quite distinct from the monks’ own choir, would usually have performed in the Lady Chapel of the monastery, because this was often the only part of the monastic church to which the laity had access. Dover Priory, however, was far from wealthy—in the early 1530s its annual income was about £170, less than a tenth of that of a major Benedictine abbey such as St Albans—and it can hardly have been in a position to spend lavishly on music. On the other hand, the fact that the priory employed a lay organist at all could be taken to imply quite a serious commitment to music. In addition, Dover was a cell or dependent house of Canterbury Cathedral, which was itself a Benedictine priory. The cathedral had a long and lively musical tradition involving not only the maintenance of a professional Lady Chapel choir but also the encouragement of the monks’ own musical talents; it seems quite possible that this could have assisted the exploitation of music at Dover. Even so, any choir available to Tallis at Dover Priory must surely have been tiny—perhaps solo voices on each of the lower lines and three or four boys at the top of the texture. There seems to be no record of Tallis’s departure from Dover, but the priory itself was dissolved in the autumn of 1535, very soon after it had been visited by the king’s commissioners. This could indicate that something was seriously amiss; before the government’s scheme for dissolving the smaller monasteries was put into general operation in 1536, only the most indigent, corrupt or otherwise decrepit houses were closed down immediately following an official visitation. We next encounter Tallis in 1537—8 in London, where he is employed (it is not clear whether as a singer or as organist) by the parish church of St Mary-at-Hill in Billingsgate, a little to the west of the Tower of London. Robert Okeland or Hockland, later to be one of Tallis’s colleagues in the Chapel Royal (the religious department of the royal household, including both clerics and musicians), had been organist of St Mary’s in 1534—5. St Mary’s seems to have been one of the most enterprising London churches in its promotion of music: it had bought a new organ in 1517—18, by the mid-1530s it was maintaining a choir capable of singing music in five parts, and its repertory included Masses, antiphons, music for the Lady Mass, and ‘carolles for cristmas’. London, with its teeming social, religious, intellectual and commercial activity, and its proximity to the main centres of government and patronage, must surely have been a far more stimulating environment than Dover. Some four miles south-east of St Mary’s lay the royal palace of Greenwich, Henry VIII’s favourite residence during the latter part of his life; Tallis may well have come into contact with the singers of the Chapel Royal and the chamber musicians of the king and queen, some of whom owned or rented property in Greenwich or in the city. He may even have met some of the Chapel Royal singers in a professional capacity: several times during the 1510s and 20s some of them had sung at St Mary’s on major feast days, and it is possible that this practice continued in the 1530s. Whatever its attractions, London proved to be only a staging post for Tallis. It was probably in the autumn of 1538 that he moved to the Augustinian abbey of Holy Cross at Waltham in Essex; the closeness of the abbot’s London house to the church of St Mary-at-Hill may help to explain this m ove. With a yearly income of some £900 Waltham Abbey was well able to maintain a Lady Chapel choir; in the late 1530s this consisted of about half-a-dozen boys and probably a similar number of men, among whom Tallis was evidently one of the most senior. If the prospect of long-term security had lured Tallis to Waltham, his plans soon went awry. In the very same year that he moved to the abbey the government embarked on the dissolution of the greater monasteries; on 23 March 1540 Waltham became the last English abbey to be dissolved. Because Tallis had joined the staff only recently he was not awarded a pension; instead he received 20s. In outstanding wages and 20s. ‘reward’. Reflection on this phase of Tallis’s life may be instructive to those who use hindsight uncritically. It is tempting for us to see the course of the English Reformation as having been inevitable and predictable; yet here we observe Tallis, who was presumably as capable of sensing what was in the wind as any other professional musician in London, making a career move that would bring him to a dead end some eighteen months later. In fact , during the late 1530s and early 1540s government policy on religion was astonishinglyunpredictable and sometimes contradictory, and this must have had an extremely unsettling effect on church music. One might expect that in 1540 the prospects of reemployment for a redundant church musician would have looked decidedly bleak. Paradoxically, however, the dissolution of the monasteries itself created some attractive opportunities. About half of the cathedrals of medieval England—Bath, Canterbury, Coventry, Durham, Ely, Norwich, Rochester, Winchester and Worcester—had been Benedictine priories. When these were dissolved most of them were promptly refounded as secular cathedrals, and in their new guise they were equipped with larger professional choirs than they had ever been able to maintain during their monastic existence. As a native of Kent and a former organist at Dover Priory, Tallis may have been able to pull a few strings at Canterbury, which had been surrendered to the Crown on 4 April. At any rate, his name is given pride of place among the lay-clerks in an undated list of recruits for the new choir that seems to have been drawn up in the summer of 1540. Consisting of ten boys and twelve men, the choir was clearly designed to be worthy of England’s mother church. Here Tallis was a senior member of an ensemble probably at least twice as large as any to which he had hitherto belonged. He was a member of this choir during what must have been a very busy period while it rapidly built up an impressive and markedly conservative musical repertory. It is interesting to note that during the early 1540s Canterbury was a centre of fierce religious controversy: while the arch bishop Thomas Cranmer, was a leading advocate of religious reform, several influential members of the cathedral chapter were staunchly traditionalist; they were soon to attempt to prosecute their archbishop for heresy. Despite this excitement—or perhaps because of it—Tallis stayed at Canterbury for only two years. In 1542 he was appointed a Gentleman (that is, a singer) of the Chapel Royal; he may have owed his good fortune to Archbishop Cranmer, who had become one of the king’s most trusted counsellors. Tallis had now risen as high in his profession as it was possible to rise, and it is no surprise that he remained a member of the Chapel Royal for the rest of his life. Even if he had desired to make another career move, the opportunities for doing so were shortly to become extremely limited because of the wholesale disbanding of church choirs that occurred during the reign of Edward VI (1547–53). Tallis may well have served as organist of the chapel throughout his membership of it, although he was not given this title until the 1570s. In about 1552 he married—an action often postponed until a man felt that he had achieved stability—but it appears that he and his wife Joan did not have children. Tallis’s later career will be covered in more detail in the notes to the recordings in this series devoted to his later music. By the time of his death in 1585 he had become the doyen of English music: a composer of immense and greatly varied experience, the mentor and business partner of William Byrd, and a link with a past that was rapidly receding beyond men’s memory. He had been born about a hundred years after the death of Chaucer; he died a hundred years before the birth of Handel. Tallis embarked upon his musical career at a time when the culture of church music in England was at its zenith. A remarkably large number of religious foundations—royal and aristocratic household chapels, cathedrals, collegiate churches, the larger monasteries, even parish churches—were assiduously cultivating choral music of a particularly elaborate, colourful and virtuosic kind. Standards of choral singing in England seem to have been extremely high, and were applauded by observers from abroad, even though the idiom of English music might have seemed old-fashioned to anybody familiar with the work of Josquin. The culmination of this style was probably reached in the mid-1520s, when composers such as John Taverner, Nicholas Ludford, Richard Pygott and Hugh Aston infused into the established style a new sense of discipline and drive. Possibilities of change were, however, already in the air: by the late 1520s some composers were beginning to experiment with a more sober musical style which placed greater emphasis upon audibility of text and clarity of design rather than upon richness of sound and profusion of ornament. It is tempting but probably too glib to interpret such experiments as having been motivated exclusively by religious—let alone by Protestant—ideas; the motivation could have been partly or even purely musical, for it is difficult to see how the florid style of the 1520s could have developed except through quite radical change. On the other hand, church music can hardly have failed to be affected by the reformist ideas that the government found it expedient to tolerate for most of the 1530s, at least until the king himself laid out a very conservative religious position towards the end of the decade. For young composers like Tallis the times must surely have been both stimulating and confusing. In early Tudor England, until the abolition of the Latin rite and the introduction of The Booke of the Common Prayer on Whitsunday, 9 June 1549, composers produced four main types of church music: Masses, Magnificats, votive antiphons and smaller liturgical pieces. English Masses, which included large-scale settings intended for major feast days and smaller settings for more general use, usually had four movements—Gloria, Credo, Sanctus with Benedictus, and Agnus Dei—related to each other through shared musical material. The Magnificat was sung during the evening service of Vespers. Votive antiphons we re settings of devotional texts sung after Compline, the final service of the day, in front of the image or altar of the saint to whom the text was addressed. The smaller liturgical pieces were fairly miscellaneous, but typically included settings of plainchant items sung in the Lady Mass (the special votive Mass of the Virgin) or on special days such as Easter and Christmas; the plainchant melody to which the text was normally sung was often incorporated into the polyphonic setting. During the 1530s the standard English choral texture consisted of five voices: treble, alto (usually called ‘mean’), high tenor, low tenor or baritone, and bass. Smaller choirs or more modest occasions might call for music in four or even three voices. It seems that the organ did not accompany vocal polyphony, although it sometimes alternated with the choir in a verse-by-verse performance of some polyphonic items; it could also reinforce or replace the choir in the performance of plainchant, and it certainly contributed voluntaries. Other instruments appear to have had no regular role in the performance of church music. Of the four musical categories mentioned in the previous paragraph, only the Magnificat is not represented on this recording (Tallis’s four-part setting may nevertheless date from the 1530s). The votive antiphon is represented by three large-scale works, Ave Dei patris filia, Ave rosa sine spinis and Salve intemerata; the Mass by a small-scale setting based on Salve intemerata; and the liturgical category by two items from the Lady Mass, Alleluia: Ora pro nobis and Euge celi porta. Dating these works—even placing them in chronological order—poses some interesting problems, because the evidence of the musical sources is sometimes at variance with that of the music. A chronology based solely on musical style would almost certainly place the four larger works in the order given above. betrays distinct signs of inexperience; Ave rosa sine spinis resembles Ave Dei patris filia quite closely but evinces a somewhat stronger sense of control; Salve intemerata is markedly better planned and more skilfully written than the other two antiphons, and must obviously pre-date the Mass derived from it. The source evidence, however, appears to throw doubt upon these conclusions. Ave rosa sine spinis and Salve intemerata and its associated Mass were all included in a set of partbooks (Cambridge, University Library Peterhouse MSS 471—4) compiled for Canterbury Cathedral at about the time when Tallis joined the cathedral choir in 1540; Tallis himself may well have made these works available to the copyist. Yet Ave Dei patris filia was not copied into this set of partbooks, and in fact survives only in late Elizabethan and Jacobean sources post-dating the composer’s death. If this really is the earliest of Tallis’s votive antiphons, why is it preserved only in very late sources? In this context the absence of Ave Dei patris filia from the partbooks copied for Canterbury could be significant. Perhaps Tallis did not offer Ave Dei patris filia for copying—perhaps he even tried to suppress it—because he regarded it as a student composition unrepresentative of his maturity. There is also a problem concerning the dating of Salve intemerata. The musical evidence suggests that this is the latest of the three votive antiphons under consideration, and yet it is preserved in what is generally thought to be the oldest source to contain any music by Tallis, a single partbook (London, British Library, Harley MS 1709) whose other contents are more redolent of the 1520s than of the 1530s. Furthermore, the text set by Tallis appeared in print for the first time in a book of hours published in 1527. It might therefore seem tempting to place the composition of Salve intemerata in the late 1520s, and to push Ave Dei patris filia and Ave rosa sine spinis back into the mid-1520s to allow time for the process of maturation that seems to have taken place between the composition of these works. However, the implications need to be thought through, because they pose some awkward questions. If Tallis was composing music of this quality in the 1520s, why was he still occupying an extremely minor musical position in 1532? Why did his career take so long to gain momentum? Why, having just moved to Canterbury in 1540, did he contribute only three works to the set of partbooks currently being compiled for the cathedral? If we accept the conclusion, based on the evidence of musical style, that the four large works on this recording were composed in the order Ave Dei patris, Ave rosa sine spinis, Salve intemerata, and the Mass Salve intemerata, it is very difficult to avoid the inference that Tallis’s career as a composer must have begun in the 1530s, not in the 1520s. The position of organist at Dover Priory would have been suitable for a young man on the threshold of a musical career; the move to London would have presented a more experienced but still unestablished musician with greater challenge and opportunity, albeit with less security; the post at Waltham Abbey seems to have offered seniority and perhaps are turn to security; the moves to Canterbury and the Chapel Royal marked further progress up the professional ladder. If this hypothesis is correct, Tallis may well have been born some five years later than is generally thought, around 1510 rather than around 1505. Any attempt to attach these compositions to particular stages in Tallis’s early career will necessarily be speculative. The evident immaturity of Ave Dei patris filia makes one wonder whether it might have been composed during the years at Dover Priory. Ave Dei patris filia reveals its immaturity in several ways: the melodic writing is rather aimless, unbalanced and inconsistent, with little of the pungency that we associate with Tallis; the internal proportions are not always convincing, particularly in the frequent changes of texture towards the end of the piece; and some of the part—writing is less than deft. In addition, there are some remarkable similarities of rhetorical gesture, scoring and even musical material between Tallis’s and Robert Fayrfax’s settings of this text, as though Tallis were basing his work on an approved model. Fayrfax, who died in 1521, was apparently regarded as the greatest composer of his day, and his setting of Ave Dei patris filia was one of his most popular works—just the sort of work, in fact, that an apprentice composer might choose as a model. It would be wrong to imply that Tallis’s Ave Dei patris filia is unworthy of our attention. The work has a distinct personality—in particular the qualities of sobriety and restraint that inform so much of Tallis’s later music are already in evidence—and it gives us a rare opportunity to observe an early Tudor composer learning his craft. Until recently, Ave Dei patris filia has been considered unperformable because it survives in a very incomplete and corrupt state: large portions of the treble and tenor parts are missing, and some sources apparently preserve the music in a modernised form reflecting the taste of the 1600s rather than that of the 1530s. The edition used in this performance is one of two recently published which attempt to restore the piece to something like its original state. Ave rosa sine spinis is essentially very similar to Ave Dei patris filia except that the composer seems rather more sure of himself. The melodic writing has a slightly greater sense of logic and purpose, the part-writing is a little less clumsy, and the composition seems to be more successfully shaped and paced. Where the ‘Amen’ section of Ave Dei patris filia sounds almost like a perfunctory afterthought, that of Ave rosa makes a very effective and well-sustained climax. Like Ave Dei patris, Ave rosa also survives in an incomplete state. In this case, however, far less is missing; all that hasto be supplied is the treble voice in the treble-bass duet beginning ‘Benedicta tu in mulieribus’. On this recording Ave rosa is sung by five solo voices, as it might well have been if it was performed at Dover Priory. Ave Dei patris filia and Ave rosa sine spinis resemble each other not only in their general style but also in their texts, which are rather feeble effusions to Our Lady of a kind all too common in the early Tudor votive antiphon. The text of Ave Dei patris filia is simply a series of threadbare compliments to the virgin, ending with a request for her intercession. The text of Ave rosa is somewhat more enterprising: an expansion of the ‘Hail Mary’ in which each word or phrase of the parent prayer—‘Ave ’, ‘ Maria’, ‘ gratia plena’, ‘Dominus tecum’ and so on—begins a stanza of the poem. The text of Salve intemerata, on the other hand, is a very different matter: it is a lengthy, complex and carefully argued prose prayer to Mary. Devotional texts of this type, addressed either to Mary or to Jesus and tenaciously dialectic in character, seem to have become popular with some English composers—or with their patrons—during the 1530s and early 1540s. Taverner’s Gaude plurimum and O splendor glorie and Ludford’s Domine Jesu Christe are comparable texts set by two of Tallis’s senior contemporaries, and Domine Deus celestis is one set by a slightly younger man, Christopher Tye. Salve intemerata is just the kind of text that one might expect Tallis to have come across in London rather than in the more conservative atmosphere of Dover or Waltham. There is no obvious reason why the 1527 book of hours in which the text first appeared could not have been available to Tallis some ten years later, or why the set of partbooks to which Harley 1709 belonged could not still have been in use in the late 1530s. The challenge of setting the Salve intemerata text to music must surely have seemed daunting to a composer of Tallis’s generation. Being in prose, it did not provide a stanzaic structure or rhyme scheme that the composer could incorporate into his musical construction; being verbose and rhetorical, it demanded a musical setting that was both concise and imposing; being intricate and carefully argued, it required music that would both clarify and adorn. Tallis’s achievement in meeting the challenge is astonishing. The music is just as closely argued as the text, and is patently designed to suit its rhetorical purpose. Two compositional techniques—imitation and motivic writing—make an especially significant contribution to this compelling musical argument. Imitation, involving the passing of musical ideas from one voice to another, creates the impression of a topic being argued out by a group of people; it is noteworthy how Tallis tends to make all the voices except the imitating voice melismatic, so that the texted voice carries even more effectively through the texture. Motivic writing, which entails the generation of melodic lines out of constantly re-used and subtly varied components, creates the impression of a developing train of thought, highly appropriate to the character of the text being set. The suggestion by some commentators that in Salve intemerata Tallis is too disciplined and single-minded, too earnest about demonstrating his abilities, underestimates the cogency of this massive work, and its significance for Tallis’s own musical development. If the forty-part motet Spem in alium was to be Tallis’s musical Everest, Salve intemerata was his Matterhorn. Tallis’s Mass Salve intemerata is closely based upon his votive antiphon. The relationship between the two works is especially close in the Gloria, where Tallis adds hardly any new material, merely making rhythmic alterations in order to accommodate the new text. The other movements become progressively less reliant upon the material of the antiphon, so that about a quarter of the Credo, a third of the Sanctus and half of the Agnus Dei are freely composed. Although the tenor part of the entire Mass is missing, it can be restored with certainty wherever the Mass quotes from the antiphon, because the quotation is literal; in the freely-composed sections there is more room for manoeuvre, but Tallis’s fondness for imitative writing is often helpful to the restorer. The idea of composing a Mass by re-using the music of an existing composition was not new—Fayrfax had tried it in his votive antiphon and Mass O bone Jesu about a generation earlier—but it seems to have attracted renewed interest in the 1530s. Tallis’s immediate models were probably Tavener ’s Masses Mater Christi and Small devotion / Sancti Wilhelmi, derived from the composer’s own votive antiphons Mater Christi and Christe Jesu respectively, but in one respect Tallis is a great deal bolder than Taverner. Where Taverner redeployed his music in an essentially similar context, Tallis’s re-use of his material shows it in a radically new light: where the antiphon is a large-scale public work, the Mass is concise and intimate. Tallis’s dexterity in adapting the pre-existing music to its new environment and blending it with the new material is quite remarkable, the more so because it is so unobtrusive: the craftsmanship is of the highest order. The other two polyphonic works on this recording are of a rather different character. They are four-part settings of plainchant items sung during the Lady Mass.Alleluia [Ora pro nobis] is the Alleluia sung in the Lady Mass on Tuesdays from Purification to Advent. Tallis sets only the choral Alleluia, and places the plainchant monorhythmically in the second highest of the four voices; the opening Alleluia and the verse Ora pro nobis would have been sung in plainchant by soloists. Euge celi porta is the second verse of the Sequence Ave preclara maris stella, sung in the Lady Mass on Sundays (and also on the octave of the Assumption); here the plainchant is sung in a decorated form in the tenor line. It is possible that Tallis originally composed music for all the even numbered verses of the Sequence, so that a complete liturgical performance would have alternated polyphony and plainchant or organ. Both of these pieces survive only in the Gyffard partbooks (London, British Library, Additional MSS 17802–5) which date from the reign of Mary, but on grounds of style they seem to belong to an earlier stage of Tallis’s career. The Alleluia, in fact, sounds more like Taverner than Tallis, and both pieces contain some rather surprising noises which may be the result of inaccurate copying. Cet enregistrement est le premier d’une série destinée à couvrir la totalité de l’oeuvre musicale de Thomas Tallis. Il contient la musique liturgique composée pendant les dix premières années de sa carrière, probablement entre 1530 et 1540. Nous ne savons que fort peu de choses sur la vie de Tallis, et en particulier sur ses années de jeunesse. Il est probablement né dans le Kent pendant la première décennie du seizième siècle. Quand nous le rencontrons pour la première fois, en 1532, il est organiste du prieuré de Douvres, un petit monastère bénédictin qui ne comptait guère qu’une douzaine de moines. Nous ne savons pas si les activités professionnelles de Tallis se limitaient à ses interprétations à l’orgue ou s’il avait aussi la possibilité de travailler avec des chanteurs professionnels. Les monastères les plus opulents de l’époque s’efforçaient certainement de contribuer à la promotion d’une musique liturgique raffinée par l’emploi d’un petit choeur de chanteurs professionnels laïques. Un tel choeur, qui demeurait parfaitement distinct du choeur des moines, donnait généralement ses interprétations dans la Chapelle de la Vierge du monastère, parce que c’était souvent la seule partie de l’église qui soit ouverte à l’accès des visiteurs laïques. Le prieuré de Douvres, quant à lui, n’était certainement pas opulent. Ses revenus au début des années 1530 se montaient à £170, moins du dixième des revenus de l’une des grandes abbayes bénédictines comme celle de St Albans—et il n’était certainement pas à même de financer des activités musicales ambitieuses. D’un autre côté, le fait que le prieuré trouvait moyen de financer un organiste séculier sur ses maigres deniers suggère que la musique y occupait une place de choix. De plus, le prieuré était une cellule ou antenne de la cathédrale de Canterbury, qui était elle-même une abbaye bénédictine. La cathédrale jouissait d’une longue et riche tradition musicale, illustrée par son emploi d’un choeur de chanteurs professionnels pour la Chapelle de la Vierge, mais aussi par l’encouragement donné au développement des talents musicaux des moines. Il est possible que cet aspect de leur tradition soit responsible du soutien apporté à la culture musicale du prieuré de Douvres. De toute manière, même si Tallis a pu bénéficier de l’assistance d’un choeur au prieuré de Douvre s, il n’a pu s’agir que d’un très petit groupe—peut-être un soliste pour chacune des parties dans les graves, et trois ou quatre garçons en haut de la tessiture. Il n’existe aucun document confirmant le départ de Tallis de Douvres, mais le monastère lui-même a été dissous en 1535, peu de temps après qu’il ait reçu la visite des inspecteurs de la couronne. Ceci semble indiquer que le monastère était en proie à de sérieux problèmes. Avant que le programme gouvernemental de dissolution des petits monastères n’ait été officiellement lancé en 1536, seuls les monastères indigents, dissolus ou délabrés étaient dissous si rapidement après la visite des représentants de la couronne. Nous retrouvons Tallis en 1537-38 à Londres où il est employé (il n’est pas clair si c’est en qualité de chanteur ou d’organiste) par l’église paroissiale de St Mary-at- Hill à Billingsgate, à quelque distance à l’ouest de la Tour de Londres. Robert Okeland ou Hockland, qui devait être plus tard l’un des confrères de Tallis à la Chapelle Royale (le département religieux de la maison royale qui regroupait les gens d’église et les musiciens), a été organiste à St Mary de 1534 à 1535. Il semble que St Mary ait été l’un des centres de culture musicale les plus florissants à Londres. La paroisse avait en 1517-18 fait l’acquisition d’une nouvelle orgue et, vers le milieu de la décennie 1530, elle entretenait un choeur capable de chanter de la musique à cinq voix. Son répertoire incluait des Messes, des antiennes, des compositions destinées à la célébration de la Messe de la Vierge et des ‘carolles for cristmas’ (chants de Noël). Londres, avec son activité sociale, religieuse, intellectuelle et commerciale effervescente et sa proximité des grands centres de gouvernement et de patronage artistique, devait sans aucun doute constituer un environnement bien plus propre à stimuler la création que Douvres. Le palais royal de Greenwich était situé à six kilomètres au sud-est de St Mary. Ce palais était la résidence favorite du roi Henri VIII vers la fin de sa vie. Il est possible que Tallis ait eu des contacts avec les chanteurs de la Chapelle Royale et les musiciens de chambre du roi et de la reine, don’t certains étaient propriétaires ou louaient des résidences à proximité de Greenwich ou dans la cité. Il est même possible qu’il ait été amené possible que cette pratique se soit poursuivie jusqu’aux années 1530. Quels qu’aient été ses attraits, Londres n’en a pas moins été qu’une étape dans la carrière de Tallis. C’est probablement à l’automne de 1538 qu’il est venu résider à l’abbaye augustinienne de la Sainte- Croix à Waltham dans l’Essex. Le fait que la résidence londonienne de l’abbé se trouvait à proximité de St Mary-at-Hill explique probablement ce départ. Disposant de revenus annuels de £ 900, l’abbaye de Waltham était certainement à même de financer un choeur pour la Chapelle de la Vierge. Vers la fin des années 1530, il consistait en une demi douzaine de garçons et probablement le même nombre d’hommes, parmi lesquels Tallis faisait bien évidemment figure de doyen. Si Tallis a été attiré à Waltham par la perspective d’un emploi stable, la fatalité a bien vite déjoué ses espoirs. L’année même de l’arrivée de Tallis à Waltham, le gouvernement lançait son entreprise de dissolution de tous les principaux monastères. Le 23 mars 1540, l’abbaye de Waltham est devenue la dernière des grandes abbayes anglaises à subir la dissolution. Tallis, qui venait à peine de prendre ses fonctions, n’a pas eu droit à une pension. En compensation il a reçu 20 shillings d’arriérés plus 20 shillings octroyés à titre de ‘récompense’. Ceux qui ont tendance à s’adonner aux facilités de la sagesse rétrospective feraient bien de méditer cet épisode de la vie de Tallis. Il est facile en effet de croire avec le recul dont nous disposons que la marche de la Réforme anglaise était inévitable et prévisible. Et cependant nous voyons Tallis, qui était aussi capable que tout autre musicien de Londres de deviner le cours futur des événements, s’engager dans une carrière qui le conduit en dix-huit mois à la catastrophe. En fait, au cours des années 1530 et au début de la décennie 1540, la politique du gouvernement en matière religieuse était remarquablement imprévisible et sujette à de nombreuses contradictions. Et cette incertitude n’a pas manqué d’affecter le cours de l’évolution de la musique liturgique. On peut croire que pendant les années 1540, les possibilités de réemploi pour tous les musiciens d’église que la dissolution avait chassés des monastères devaient être bien précaires. Paradoxalement, c’est la dissolution même des monastères qui a occasionné le développement de nouvelles filières professionnelles. La moitié environ des cathédrales de l’Angleterre médiévale, Bath, Canterbury, Coventry, Durham, Ely, Norwich, Rochester, Winchester et Worcester avaient été des abbayes bénédictines. Une fois les monastères dissous, ils se sont rapidement reconstitués en cathédrales laïques, et c’est dans ce nouveau cadre que se sont développés des choeurs professionnels plus nombreux qu’ils ne l’avaient jamais été à l’époque des monastères qui n’auraient pas pu les financer. En tant que natif du Kent et en sa qualité d’ancien organiste du prieuré de Douvres, Tallis a probablement bénéficié de l’appui de quelques contacts personnels à Canterbury, qui était passée sous le contrôle de la couronne en 1540. Quoi qu’il en soit, son nom figure à la place d’honneur sur une liste non datée de chanteurs laïques recrutés pour le nouveau choeur de la cathédrale et qui semble avoir été réorganisé pendant l’été de 1540. Le choeur, qui comprenait dix garçons et douze hommes, était sans doute conçu pour faire honneur à la première église d’Angleterre. Tallis se retrouve donc en situation de doyen d’un choeur bien plus important qu’aucun de ceux auxquels il lui a précédemment été donné d’être associé. La période durant laquelle il a été membre de ce choeur est marquée par une activité intense et la mise en place rapide d’un répertoire important d’une musique d’inspiration d’ailleurs assez traditionnelle. Il est intéressant de noter que pendant les premières années de la décennie 1540, Canterbury a été le cadre d’une violente querelle religieuse. L’archevêque, Thomas Cranmer, était un partisan inconditionnel de la réforme religieuse, mais plusieurs des membres du chapitre de la cathédrale étaient des traditionalistes tout aussi intransigeants et qui allaient bientôt entreprendre de poursuivre leur archevêque pour hérésie. Malgré l’animation de ces querelles—ou peut-être à cause d’elles—Tallis n’est resté que deux ans à Canterbury. En 1542, il est nommé Gentilhomme (c’est-à-dire chanteur) de la Chapelle Royale. Il est possible qu’il doive sa promotion au soutien de l’archevêque Cranmer, qui s’était à ce moment-là élevé au rang de conseiller principal jouissant de la confiance du roi. Tallis avait lui aussi par là même atteint le sommet de la carrière de musicien de l’époque, et il n’est donc pas surprenant qu’il soit demeuré membre de la Chapelle Royale jusqu’à sa mort. Même s’il avait envisagé une réorientation de sa carrière professionnelle, les occasions de changement allaient bientôt s’amenuiser du fait des dissolutions des choeurs d’église qui se sont multipliées au cours du règne de Edouard VI (1547-53). Il est possible que Tallis ait fait office d’organiste de la chapelle pendant toute la période qu’il y a passée, mais le titre officiel ne lui a pas été décerné avant les années 1570. Vers 1552, il s’est marié—une décision qui était souvent à l’époque remise à plus tard, jusqu’à l’obtention d’une fonction qui garantisse une certaine stabilité professionnelle—mais il semble que sa femme Joan et lui n’eurent jamais d’enfants. Le reste de la carrière de Tallis est décrit plus en détail dans le cadre des commentaires des autres enregistrements prévus dans cette série et qui couvrent la musique composée plus tard dans sa vie. A l’époque de sa mort en 1585, il était devenu le doyen de la musique anglaise—un compositeur jouissant d’une expérience énorme et variée, mentor et partenaire commercial de William Byrd, et lien vivant avec un passé qui déjà s’éloignait rapidement dans la mémoire de ses contemporains. Il est né environ cent ans après la mort de Chaucer, et sa mort précède de cent ans la naissance de Haendel. Tallis s’est lancé dans sa carrière musicale à une époque où la musique d’église atteignait en Angleterre une ère d’apogée. Un nombre remarquable d’institutions religieuses—chapelles privées aristocratiques et royales, cathédrales, églises collégiales, grands monastères, et même les églises paroissiales—se consacraient toutes avec zèle à la promotion d’une musique chorale présentant un remarquable caractère de couleur, de richesse et de virtuosité. La musique chorale en Angleterre se distinguait par son très haut niveau d’expertise et elle était louée par les visiteurs étrangers, en dépit du fait que l’idiome dans lequel la musique anglaise continuait à s’exprimer devait sembler singulièrement démodé à quiconque était familier avec les oeuvres de Josquin. Il faut probablement situer l’apogée de ce style au niveau du milieu des années 1520, à l’époque où des compositeurs comme John Taverner, Nicholas Ludford, Richard Pygott et Hugh Aston ont ensemble insufflé à ce style bien établi une énergie et un sens de la discipline qui l’ont amené à sa perfection. Le changement était pourtant déjà dans l’air et vers la fin des années 1520 certains musiciens commençaient à expérimenter avec un style plus sobre qui plaçait une importance plus grande sur l’audibilité des textes et la clarté architecturale des compositions, plutôt que sur la richesse du son et la profusion des ornements. Il est tentant mais par trop facile de suggérer que ces changements reflètent essentiellement la nouvelle atmosphère religieuse, ou même qu’elles marquent tout simplement l’émergence d’une éthique protestante. Le changement a pu en fait avoir des causes endogènes propres à la logique de l’évolution musicale, car il est difficile de concevoir dans quelle direction la musique fleurie et saturée d’ornements des années 1520 aurait pu évoluer, si ce n’est dans celle d’un changement radical. D’un autre côté, il est évident que la musique d’église n’a pas pu rester indifférente aux idées des réformateurs que le gouvernement a trouvé expédient de tolérer pour la plupart jusqu’à la fin des années 1530, au moins jusqu’à ce que le roi lui-même ne prenne l’initiative d’imposer un retour au conservatisme religieux, vers la fin de la décennie. Pour les jeunes compositeurs comme Tallis, l’époque a dû sans aucun doute être source de stimulation autant que de confusion. Au début de l’époque Tudor en Angleterre, jusqu’à l’abolition du Rite Latin et à l’introduction du Booke of the Common Prayer (le livre de prière commune), le 9 juin 1549, dimanche de Pentecôte, les compositeurs produisaient principalement quatre types de musique d’église: les Messes, les Magnificats, les antiennes et les pièces liturgiques plus courtes. Les Messes anglaises, qui comptaient des oeuvres conçues sur une grande échelle pour la célébration des grands jours de fête, mais aussi des pièces plus intimes destinées à une célébration plus quotidienne, étaient en général conçues en quatre mouvements—le Gloria, le Credo, le Sanctus avec Benedictus et l’Agnus Dei—reliés les uns aux autres par des structures musicales communes. Le Magnificat était chanté à l’occasion de la Messe du soir, les Vêpres. Les antiennes étaient des mises en musique de textes de dévotion chantées après les Complies, le dernier office de la journée, en face de l’image ou de l’autel du saint à qui elles étaient dédiées. Les pièces liturgiques plus courtes recouvraient tout un ensemble de formes, mais comprenaient de manière typique des mises en musique d’éléments de plain-chant chantées pendant la Messe de Notre Dame (la Messe votive spécialement consacrée à la célébration de la Vierge) ou lors de certaines occasions spéciales comme Pâques ou la Noël. La mélodie de plain-chant sur lequel le texte était normalement interprété était souvent incorporée à la texture polyphonique. Au cours des années 1530, la tessiture caractéristique de la musique chorale anglaise consistait en cinq parties: soprano, alto (souvent désigné du nom de ‘médian’), haut ténor, ténor basse ou baryton et basse. Les choeurs plus modestes et les occasions moins grandioses se contentaient de musique à quatre ou même quelquefois à trois voix. Il semble que l’orgue n’accompagnait pas la polyphonie chorale, bien qu’il arrivât souvent qu’elle alterne avec le choeur dans certains chants polyphoniques où le texte était récité un vers à la fois. Elle pouvait aussi remplacer ou renforcer le choeur dans une exécution de plain-chant, et elle jouait certainement un rôle important dans les volontaires. D’autres instruments semblent ne pas avoir joué de rôle défini dans le cadre de la musique liturgique. Des quatre catégories de compositions mentionnées au paragraphe précédent, seul le Magnificat ne figure pas parmi les enregistrements proposés ici (il est possible toutefois que la composition à quatre voix de Tallis date en fait des années 1530). L’antienne est représentée par trois compositions de grande envergure—Ave Dei patris, Ave rosa sine spinis et Salve intemerata; la Messe est représentée par une composition de moindre envergure basée sur le Salve intemerata; et la catégorie des compositions liturgiques est représentée par deux extraits de la Messe de Notre Dame, Alléluia [Ora pro nobis] et Euge celi porta. La datation de ces oeuvres, en fait leur simple rangement dans un ordre chronologique, pose des problèmes intéressants parce que les indications fournies par les sources musicales contredisent parfois les considérations tirées de la musique elle-même. Une chronologie basée seulement sur le style musical placerait de manière presque certaine les quatre grandes compositions dans l’ordre donné ci-dessus. Ave Dei patris filia trahit un certain manque d’expérience; Ave rosa sine spinis ressemble de près à Ave Dei patris filia mais il s’en dégage un sentiment plus grand de maîtrise artistique; Salve intemerata est construite et écrite avec une plus grande expertise que les deux autres antiennes, et doit évidemment être antérieure à la Messe qui en est dérivée. Un examen des sources musicales semble cependant remettre en doute ces conclusions. Ave rosa sine spinis et Salve intemerata et la Messe qui lui est associée sont tous inclus dans l’ensemble de livrets (Cambridge, University Library, Peterhouse MSS 471-4) compilés pour le compte de la cathédrale de Canterbury à l’époque approximative où Tallis est venu se joindre au choeur de la cathédrale en 1540. Il est possible que ce soit Tallis lui-même qui ait fourni au copiste l’original de ces oeuvres. Cependant Ave Dei patris filia n’est pas copié dans ce livret et ne survit en fait qu’à travers des sources élisabéthaines et jacobines qui sont postérieures à la mort du compositeur. S’il s’agit bien là d’une des premières antiennes que Tallis ait composées, pourquoi ne figure-t-elle que dans des sources beaucoup plus récentes? Dans ce contexte l’absence de Ave Dei patris filia dans le livret copié pour la cathédrale de Canterbury est peut-être significatif. Peut-être Tallis n’a pas offert la composition au copiste dans un effort pour éliminer la pièce du répertoire—parce qu’il la considérait comme une oeuvre de jeunesse à laquelle manquait la maturité des oeuvres ultérieures. Il existe aussi un problème en ce qui concerne la date du Salve intemerata. Les données musicologiques suggèrent qu’il s’agit là de la dernière des trois antiennes considérées et elle est cependant préservée dans ce qui est généralement considéré comme étant la source la plus ancienne que nous ayons des compositions de Tallis, un livret unique (Londres, British Library, Harley MS 1709) qui ne contient en sus que des pièces don’t le style évoque plus les années 1520 que la décennie 1530. En outre, le texte choisi par Tallis apparaît imprimé pour la première fois dans un livre d’heures publié en 1527. Il est donc tentant de placer la composition de Salve intemerata vers la fin des années 1520, et de ramener la date de composition de Ave Dei patris filia et de Ave rosa sine spinis vers le milieu des années 1520, pour permettre que s’accomplisse le processus de maturation qui semble être intervenu entre les dates de composition de ces diverses pièces. Il est cependant nécessaire de considérer en détail les implications d’une telle chronologie, car elles donnent lieu à quelques problèmes difficiles. Si Tallis composait de la musique d’une telle qualité dans les années 1520, pourquoi en 1532 n’occupait-il toujours qu’une position des plus médiocres dans le monde musical de l’époque ? Pourquoi sa carrière n’a-t-elle au départ progressé que si lentement? Pourquoi, une fois en poste à la cathédrale de Canterbury, n’a-t-il contribué que trois oeuvres au livret qui était alors en preparation? Si nous acceptons la conclusion basée sur le style musical que les quatre oeuvres principales figurant dans cet enregistrement ont été composées dans l’ordre suivant: Ave Dei patris, Ave rosa sine spinis, Salve intemerata et la Messe Salve intemerata, il est difficile d’éviter la conclusion que la carrière de Tallis a débuté pendant les années 1530 et non les années 1520. La position d’organiste au prieuré de Douvres convenait à un jeune homme sur le point de se lancer dans une carrière musicale; le départ pour Londres a dû offrir pour un musicien un peu plus expérimenté mais non encore établi, des occasions et des défis appropriés, au prix cependant d’une perte de sécurité. Le poste à l’abbaye de Waltham semble représenter une promotion ainsi qu’un certain retour à la sécurité. Le départ pour Canterbury, puis la nomination à la Chapelle Royale marquent enfin l’apogée d’une carrière musicale. Si cette hypothèse est correcte, il semble probable que Tallis soit en fait né cinq ans plus tard qu’il n’est généralement accepté, vers 1510 plutôt que vers 1505. Toute tentative visant à rattacher ces oeuvres à des phases particulières du début de la carrière de Tallis ne peut être que spéculative. L’immaturité évidente du Ave Dei patris filia pousse à se demander si la composition ne date pas de la période passée au prieuré de Douvres. L’immaturité de Ave Dei patris filia se manifeste de diverses manières. La ligne mélodique y flotte sans beaucoup d’équilibre et ne présente nullement l’énergie que nous associons traditionnellement avec les compositions de Tallis. Les proportions internes manquent de conviction, en particulier au niveau des multiples changements de tessiture qui caractérisent la dernière partie de la pièce. Enfin, l’écriture des diverses parties contient des gaucheries évidentes. En outre, il existe des similarités notoires au niveau de la rhétorique musicale, de l’écriture et même du matériau, avec la mise en musique de ce même texte par Robert Fayrfax, comme si Tallis cherchait à appuyer sa composition sur celle d’un modèle faisant autorité. Fayrfax, qui est mort en 1521, était apparemment considéré comme le plus grand compositeur de l’époque—juste le genre de musique en fait qu’un compositeur encore peu sûr de soi trouve rassurant d’imiter. Il ne faut pas cependant en conclure que Ave Dei patris filia ne mérite pas notre attention. La pièce jouit déjà d’une forte personnalité musicale—et en particulier les qualités de sobriété et de maîtrise qui sont caractéristiques de l’oeuvre ultérieure de Tallis sont déjà en évidence, et nous avons là une rare occasion de surprendre un jeune compositeur de la période Tudor en train d’apprendre son métier. Jusqu’à récemment Ave Dei patris filia a été considéré comme injouable, car la pièce nous est parvenue dans un état incomplet et la transcription contient des erreurs évidentes. Des sections entières des parties du soprano et du ténor ont disparu et quelques-unes des sources ne préservent la musique que sous une forme modernisée, qui reflète le goût des années 1600 plutôt que celui des années 1530. L’édition utilisée dans cet enregistrement est l’une des deux publiées récemment et qui tentent de restaurer à l’oeuvre son apparence originale. Ave rosa sine spinis est essentiellement très similaire à Ave Dei patris, si ce n’est que le compositeur y est beaucoup plus maître de sa technique. La mélodie a plus de consistance et de sens, l’écriture des diverses voix démontre une plus grande expertise, et la composition dans son ensemble est bien mieux construite. La section du ‘Amen’ de Ave Dei patris filia semble presque un rajout, tandis que celle de Ave rosa offre une culmination lyrique appropriée et soutenue. Comme Ave Dei patris, Ave rosa ne survit qu’à l’état incomplet. Mais dans ce cas les parties manquantes sont moins importantes, seule a été perdue la partie de soprano du duo soprano et basse au début du ‘Benedicta tu in mulieribus’. Pour cet enregistrement Ave rosa est chanté par cinq solistes, comme c’était peut-être le cas lors de son interprétation à l’abbaye de Douvres. Ave Dei patris filia et Ave rosa sine spinis se ressemblent non seulement au plan du style mais aussi au niveau des textes, pâles dévotions faiblement effusives dédiées à Notre Dame, d’un type hélas très commun dans les antiennes du début de la période Tudor. Le texte de Ave Dei patris filia n’est guère qu’une suite prosaïque de compliments à la Vierge, qui se termine sur une demande en intercession. Le texte de Ave rosa est un peu plus original. C’est une variation sur le thème du ‘Je vous salue Marie’ dans laquelle chaque mot et chaque expression de la prière originale—‘Ave’, ‘Maria’, ‘gratia plena’, ‘Dominus tecum’ etc.—sert d’attaque à une des strophes du poème. Le texte de Salve intemerata est tout autre chose. Il s’agit d’une prière en prose longue, complexe et soutenue, et don’t le fil logique est développé avec rigueur. Des textes de dévotion de ce genre, adressés à Marie ou à Jésus et construits selon un modèle dialectique soutenu, semblent avoir été populaires auprès des compositeurs anglais—ou de leurs patrons—pendant les années 1530 et au début des années 1540. Le Gaude plurimum et O splendor glorie de Taverner et le Domine Jesu Christe de Ludford présentent des textes comparables et choisis par deux contemporains plus âgés de Tallis, tandis que le Domine Deus celestis est un texte similaire mais choisi cette fois par un homme plus jeune, Christopher Tye. Salve intemerata est précisément le genre de texte susceptible de s’offrir à Tallis à Londres plutôt que dans l’atmosphère plus traditionaliste de Douvres ou de Waltham. Il n’existe aucune raison de douter que le livre d’heures dans lequel le texte apparaît pour la première fois en 1527 ne soit encore disponible dix ans plus tard quand Tallis décide d’utiliser le texte, ou que l’ensemble de livrets auquel appartient Harley 1709 n’ait été encore utilisé vers la fin des années 1530. Les difficultés de la mise en musique d’un texte comme celui du Salve intemerata ont dû paraître considérables à un compositeur de la génération de Tallis. Etant en prose, il ne présentait aucune strophe ni rime sur laquelle articuler la musique; sa nature verbeuse et rhétorique exigeait une mise en forme musicale à la fois concise et solennelle; sa complexité et sa nature dialectique requéraient une musique capable à la fois de clarifier l’architecture logique du discours et de l’embellir. La manière dont Tallis a su s’acquitter de cette tâche délicate est remarquable. La musique argumente avec autant de rigueur que le texte, et elle est évidemment conçue pour épouser son mouvement rhétorique. Deux techniques de composition—imitation et écriture motivée—sont particulièrement mis à contribution dans cette argumentation musicale convaincante. L’imitation signifie le transfert des idées musicales d’une voix sur l’autre, ce qui crée ainsi l’impression d’une discussion reprise successivement par tout un groupe de personnes; il est remarquable que Tallis impose à toutes les voix sauf la voix imitatrice le chant de plusieurs notes par syllabes, ce qui permet à la voix porteuse de s’imposer d’autant mieux à travers la tessiture. L’écriture par motif, qui consiste en la création de lignes mélodiques à partir d’éléments constamment réutilisés et soumis à de subtiles variations, crée une impression de pensée en gestation qui correspond parfaitement à la teneur du texte choisi. La suggestion par certains commentateurs que dans le Salve intemerata Tallis est trop littéral et discipliné, qu’il s’efforce par trop à faire montre de ses capacités, sous-estime la consistance intellectuelle de cette oeuvre énorme et sa signification dans le développement musical de Tallis lui-même. Si le motet à quarante voix Spem in alium est l’Everest de Tallis, Salve intemerata doit compter comme son Matterhorn. La Messe de Tallis Salve intemerata est étroitement basée sur son antienne. La relation entre les deux oeuvres est particulièrement étroite dans le cas du Gloria que Tallis reproduit sans rien y ajouter, si ce n’est quelques variations rythmiques destinées à accommoder le nouveau texte. Les autres mouvements s’émancipent peu à peu par rapport au matériau de l’antienne, si bien qu’environ un quart du Credo, un tiers du Sanctus et la moitié de l’Agnus Dei sont composés en toute liberté. Bien que la partie de ténor de toute la Messe ait été perdue, elle peut être reconstituée avec certitude chaque fois que la Messe se modèle sur l’antienne, car la citation est littérale. Dans les sections composées avec plus de liberté il est plus difficile de la déterminer exactement, mais le goût de Tallis pour l’écriture imitative est un indice utile. L’idée de composer une Messe en réutilisant la musique d’une autre composition n’était pas nouvelle—Fayrfax en avait fait l’essai dans son antienne et sa Messe O bone Jesu une génération plus tôt—mais il semble que l’idée ait été très populaire dans les années 1530. Les modèles immédiats de Tallis étaient probablement les Messes Mater Christi et Small devotion / Sancti Wilhelmi de Taverner, dérivées des antiennes du compositeur Mater Christi et Christe Jesu respectivement. Mais dans un aspect au moins de son entreprise, Tallis est plus audacieux que Taverner. Taverner réutilisait ses matériaux dans un contexte essentiellement similaire, Tallis réutilise les siens dans un contexte entièrement différent. L’antienne était une oeuvre publique de grande envergure tandis que la Messe est concise et intime. La dextérité avec laquelle Tallis adapte son matériau à ce nouvel environnement et l’intègre au matériau nouveau est d’autant plus remarquable que toute trace de mélange disparaît complètement. Il s’agit d’une oeuvre d’un très haut niveau d’expertise technique. Les deux autres oeuvres polyphoniques figurant dans cet enregistrement sont très différentes. Il s’agit de pièces de plain-chant à quatre voix chantées pendant la Messe de Notre Dame. Alléluia [Ora pro nobis] est l’Alléluia chanté pendant la messe de Notre Dame chaque mardi pendant la période allant de la purification à l’Avent. Tallis compose seulement l’Alléluia choral et il place le plain-chant de manière monorythmique, dans la seconde des voix les plus aiguës; l’Alléluia du début du texte et le vers Ora pro nobisEuge celi porta est le second vers de la Séquence Ave preclara maris stella, chanté pendant la Messe de Notre Dame le dimanche (et aussi lors de l’octave de l’Assomption); le plain-chant y est chanté dans la partie du ténor en style ornementé. Il est possible que Tallis ait originellement composé la musique pour tous les vers correspondants à des nombres pairs, de façon à ce que l’interprétation liturgique complète fasse alterner la polyphonie et le plain-chant ou l’orgue. Ces deux morceaux ne nous sont parvenus que dans le livret de Gyffard (Londres, British Library, Supplément MSS 17802-5) qui date du règne de la Reine Marie, mais d’un point de vue stylistique, il est clair qu’ils appartiennent à une phase antérieure de la carrière de Tallis. L'Alléluia ressemble plus en fait à une composition de Taverner, qu’à du Tallis, et les deux morceaux contiennent des ‘bruits’ de nature plutôt surprenante et qui s'expliquent probablement par des erreurs de transcription. Diese Aufnahme ist die erste in einer Reihe, die dem Gesamtwerk von Thomas Tallis gewidmet ist. Sie schließt Kirchenmusik mit ein, die er im ersten Jahrzehnt seiner Karriere schreibt—ungefähr zwischen 1530 und 1540. Über Tallis’ Leben—insbesondere über seine frühen Jahre—ist relativ wenig bekannt. Er wurde wahrscheinlich im ersten Jahrzehnt des 16. Jahrhunderts in Kent geboren. Als wir im Jahr 1532 zum ersten Mal von ihm hören, ist er Organist des Dover Priory, ein kleines benediktinisches Kloster, bestehend aus etwa einem Dutzend Mönche. Wir wissen nicht, ob sich Tallis’ Pflichten auf das Orgelspielen beschränkten oder ob er die Gelegenheit hatte, mit professionellen Sängern zu arbeiten. Die wohlhabenderen Mönchshäuser der Epoche bemühten sich auf jeden Fall darum, an der zu jener Zeit üblichen Pflege kunstvoller Kirchenmusik teilzunehmen, indem sie einen kleinen Chor professioneller Sänger aus dem Laienstand anstellten; ein solcher Chor, der sich in hohem Maße vom eigenen Chor der Mönche unterschied, wäre in der Marienkapelle des Klosters aufgetreten, da dies häufig der einzige Teil der klösterlichen Kirche war, der vom Laienstand betreten werden durfte. Dover Priory war jedoch alles andere als wohlhabend—in den frühen 30ern des 16. Jahrhunderts betrug sein jährliches Einkommen in etwa £170, weniger als ein Zehntel des Einkommens eines bedeutenden benediktinischen Klosters wie St Albans—und es kann kaum in der Lage gewesen sein, viel Geld für Musik auszugeben. Andererseits scheint die Tatsache, daß das Kloster einen Laienorganisten einstellte, auf ein ernsthaftes Interesse an der Musik hinzuweisen. Außerdem war Dover eine Zelle oder abhängiges Haus der Kathedrale von Canterbury, die wiederum selbst ein benediktinisches Kloster war. Die Kathedrale hatte eine lange und lebhafte Musiktradition, zu der nicht nur die Unterhaltung eines Chores für die Marienkapelle gehörte, sondern auch die Förderung der musikalischen Talente der Mönche. Es ist durchaus möglich, daß diese Tatsache zu der Beschäftigung mit Musik in Dover beigetragen hat. Dennoch muß ein solcher, Tallis im Dover Priory zur Verfügung gestellter Chor sehr klein gewesen sein—möglich er weise ein Solist für jede der unteren Stimmen und drei oder vier Knaben für die hohen Partien. Es scheint keine Aufzeichnung über Tallis’ Verlassen von Dover zu geben, doch das Kloster selbst wurde im Herbst 1535 aufgelöst, sehr bald nachdem es von den Kommissionären des Königs aufgesucht worden war. Dies könnte darauf hinweisen, daß ernsthafte Probleme vorlagen. Vor der landesweiten Verwirklichung des Regierungsplans von 1536, die kleineren Klöster aufzulösen, wurden nur die ärmsten, korruptesten oder anderweItig heruntergekommenen Häuser sofort nach einem offiziellen Besuch geschlossen. Wir begegnen Tallis das nächste Mal zwischen 1537 und 38 in London, wo er bei der Gemeindekirche St Mary-at-Hill in Billings gate, etwas westlich des Tower of London, angestellt ist (wir wissen nicht genau, ob als Sänger oder Organist). Robert Okeland oder Hockland—später einer von Tallis’ Kollegen in der Chapel Royal (der religiösen Abteilung des königlichen Haushalts, zu der sowohl Geistliche als auch Musiker gehörten)—war von 1534 bis 35 Organist für St Mary’s gewesen. St Mary’s scheint hinsichtlich der Förderung von Musik eine der fortschrittlichsten Londoner Kirchen gewesen zu sein: sie hatte zwischen 1517 und 18 eine neue Orgel gekauft und bis zur Mitte der 30er Jahre einen Chor aufgebaut, der in der Lage war, fünfstimmig zu singen. Zu seinem Repertoire gehörten Messen, Antiphone, Musik für die ‘Lady Mass’ und ‘carolles for cristmas’ (We Ihnachtslieder). Mit seinen lebhaften gesellschaftlichen, religiösen, intellektuellen und kommerziellen Aktivitäten und seiner Nähe zu den wichtigsten Zentren der Regierung und Schirm herrschaft muß London sicher ein stimulierendes Umfeld als Dover gewesen sein. Etwa vier Meilen südöstlich von St Mary’s lag der königliche Palast von Greenwich, die beliebteste Residenz Heinrich VIII im späteren Teil seines Lebens. Tallis mag durchaus Kontakt mit den Sängern der Chapel Royal und den Kammermusikern des Königs und der Königin gehabt haben, von denen einige Grundstücke in Greenwich oder der Stadt besaßen oder gepachtet hatten. Er hat vielleicht sogar ein paar Sänger der Chapel Royal auf professioneller Ebene getroffen: im ersten und zweiten Jahrzehnt des 16. Jahrhunderts hatten eine Reihe von ihnen an bedeutenden Festtagen in St Mary’s gesungen, und es ist möglich, daß dieser Brauch auch in den 30er Jahren fortgesetzt wurde. Trotz seiner Attraktionen erwies sich London für Tallis nur als eine Durch gangsstation. Wahrscheinlich wechselte er im Herbst 1538 zur augustinischen Abtei Holy Cross in Waltham, Essex über. Dieser Wechsel läßt sich möglicherweise durch die Nähe des Londoner Hauses des Abtes zur Kirche von St Mary-at-Hill erklären. Mit einem Jahreseinkommen von £900 war Waltham Abbey durchaus in der Lage, einen Chor für die Marienkapelle zu unterhalten. In den späten 30ern des 16. Jahrhunderts bestand dieser aus etwa einem halben Dutzend Knaben und wahrscheinlich ungefähr der gleichen Anzahl von Männern, unter denen Tallis offensichtlich einer der ranghöchsten war. Wenn die Aussicht auf langfristige Sicherheit Tallis nach Waltham gelockt hatte, so wurden seine Pläne bald durchkreuzt. Im Jahr seines Umzug in die Abtei begann die Regierung mit der Auflösung der größeren Klöster. Am 23. März 1540 wurde Waltham als letzte englische Abtei aufgelöst. Da Tallis der Organisation nur kurz zuvor beigetreten war, erhielt er keine Pension, sondern lediglich die ihm noch zustehende Entlohnung von 20 Schillingen und 20 Schillinge ‘Entschädigung‚. Diese Phase in Tallis’ Leben ist für diejenigen, die mit einem unkritischen Auge auf jene Zeit zurückblicken, sehr lehrreich. Wir geraten leicht in Versuchung, den Verlauf der englischen Reformation als unvermeidlich und vorhersagbar zu betrachten; doch hier stellen wir fest, daß Tallis, der doch sicherlich wie jeder andere professionelle Musiker in London die kommenden Ereignisse erahnen mußte, einen Karriereschritt unternahm der ihn achtzehn Monate später in eine Sackgasse führte. In Wirklichkeit war die Regierungspolitik hinsichtlich religiöser Fragen in den späten 30er und den frühen 40er Jahren erstaunlich unbere chenbar und manchmal geradezu widersprüchl ich, und dies muß eine extrem beunruhigende Auswirkung auf die Kirchenmusik gehabt haben. Man sollte eigentlich erwarten, daß die Aussichten eines entlassenen Kirchenmusikers in den 40er Jahren des 16. Jahrhunderts äußerst düster waren. Paradoxerweise schuf jedoch die Auflösung der Klöster selbst einige attraktive Möglichkeiten. Ungefähr die Hälfte der mittelalterlichen Kathedralen Englands—Bath, Canterbury, Coventry, Durham, Ely, Norwich, Rochester, Winchester und Worcester— waren benediktinische Klöster gewesen. Nach ihrer Auflösung wurden die meisten von ihnen sofort als säkulare Kathedralen neu gegründet, und in dieser neuen Form mit größeren pro fessionellen Chören ausgerüstet, als dies während ihrer klösterlichen Existenz möglich gewesen wäre. Als Einheimischer Kents und ehemaliger Organist des Dover Priory war Tallis möglicher weise in der Lage, in Canterbury, das sich am 4. April der Krone ergeben hatte, einige Beziehungen spielen zu lassen. Auf jeden Fall steht sein Name an oberster Stelle unter den angestellten Laien auf einer undatierten Liste der neuen Mitglieder des Chores, die offenbar im Sommer 1540 aufgestellt wurde. Der aus zehn Knaben und zwölf Männern bestehende Chor war mit Sicherheit darauf ausgerichtet, Englands Mutterkirche alle Ehre zu bereiten. Hier war Tallis ein führendes Mitglied in einem Ensemble von wahrscheinlich doppelter Größe wie alle anderen, zu denen er bisher gehört hatte. Er war Mitglied dieses Chores in einer Phase, in der dieser äußerst beschäftigt gewesen sein muß und ein ebenso eindrucksvolles wie auch eindeutig konservatives Repertoire aufbaute. Interessanter weise war Canterbury in den frühen 40ern Zentrum einer bitteren religiösen Kontroverse: während der Erzbischof Thomas Cranmer zu den führenden Vertretern der religiösen Reform gehörte, waren eine Reihe einflußreicher Mitglieder des Domkapitels strenge Traditionalisten (die bald ihren Erzbischof wegen Ketzerei verfolgen sollten). Trotz dieser aufregenden Zeit—oder vielleicht gerade deshalb—blieb Tallis nur zwei Jahre lang in Canterbury. 1542 wurde er zum Gentleman (d.h. Zum Sänger) der Chapel Royal erhoben. Er hatte dies Glück möglicherweise Erzbischof Cranmer zu verdanken, der einer der vertrautesten Berater des Königs geworden war. Tallis war nun in seinem Beruf an der für ihn höchstmöglichen Stelle angelangt, und es ist nicht überraschend, daß er für den Rest seines Lebens Mitglied der Chapel Royal blieb. Selbst wenn er einen weiteren Karriereschritt angestrebt hätte, wären die Gelegenheiten dafür in Kürze aufgrund der allgemeinen Auflösung von Kirchenchören unter der Regierung von Edward VI (1547-53) extrem begrenzt geworden. Tallis mag während seiner Mitgliedschaft des Chores durchaus auch Organist für die Kapelle gewesen sein, obwohl er diesen Titel nicht vor den 70er Jahren erhielt. Ungefähr 1552 heiratete er—eine Entscheidung, die ein Mann häufig so lange verschob, bis er die nötige Sicherheit erlangt hatte—doch er und seine Frau Joan blieben offenbar kinderlos. Tallis’ spätere Karriere wird in den Anmerkungen zu den Aufnahmen dieser Serie, die—12 seiner späteren Musik gewidmet sind, genauererläutert werden. Bei seinem Tod im Jahr 1585 war er zum Rangältesten in der englischen Musik geworden: ein Komponist mit immenser und vielseitiger Erfahrung, der Mentor und Geschäftspartner von William Byrd und die Verbindungsfigur zu einer Vergangenheit, die unter der neuen Generation schnell in Vergessenheit geriet. Er wurde etwa hundert Jahre nach Chaucers Tod geboren und starb hundert Jahre vor Händels Geburt. Tallis begann seine musikalische Karriere zu einer Zeit, in der die Kultur der Kirchenmusik auf ihrem Höhepunkt stand. Eine erstaunlich hohe Anzahl an religiösen Organisationen—königliche und adelige Hauskapellen, Kathedralen, Kollegiatkirchen, die größeren Klöster, sogar Gemeindekirchen— kultivierten mit großem Eifer chorale Musik von besonders ausgeschmückter, farbenfroher und virtuoser Art. Der Standard des choralen Gesangs in England scheint äußerst hoch gewesen zu sein und wurde von Beobachtern aus dem Ausland sehr gelobt, trotz der Tatsache, daß das Idiom der englischen Musik jedem, der das Werk von Josquin kannte, altmodisch erscheinen mußte. Der Gipfel dieser Stilrichtung wurde wahrscheinlich Mitte der 20er Jahre des 16. Jahrhunderts erreicht, als Komponisten wie John Taverner, Nicholas Ludford, Richard Pygott und Hugh Aston den etablierten Stil durch ein neues Gefühl für Disziplin und Schwung aufrüttelten. Mögliche Änderungen lagen jedoch bereits in der Luft: ende der 20er Jahre begannen einige Komponisten mit einem nüchterneren Stil zu experimentieren, der größeren Wert auf VerständIichkeit des Textes und Klarheit des Aufbaus als auf Klangreichtum und ornamentale Fülle legte. Es ist verlockend, aber wahrscheinlich zu oberfächlich, derartige Experimente ausschließlich als den Ausdruck religiöser—geschweige denn protestantischer—Ideen zu interpretieren; die Motivation mag teilweise oder sogar völlig musikalischer Natur gewesen sein, denn es ist schwer zu verstehen, wie der blumige Stil der 20er Jahre sich ohne ziemlich radikale Veränderungen entwickelt haben könnte. Andererseits muß die Musik von reformierten Ideen beeinflußt worden sein, wenn die Regierung sie während fast der gesamten 30er Jahre tolerierte, oder zumindest bis der König selbst gegen Ende des Jahrzehnts eine sehr konservative religiöse Position bezog. Für junge Komponisten wie Tallis müssen die Zeiten sowohl stimulierend als auch verwirrend gewesen sein. Im frühen Tudor-England, bis zur Abschaffung des römisch-katholischen Ritus und der Einführung des Booke of the Common Prayer ( Buch des gemeinsamen Gebets) zu Pfingsten, dem 9. Juni 1549, befaßten sich Komponisten mit vier Hauptforrmen der Kirchenmusik: Messen, Magnifikaten, Votivantiphonen und kleineren liturgischen Werken. Englische Messen, zu denen groß ange legte Vertonungen für bedeutende Festtage und einfachere Vertonungen für den alltäglicheren Gebrauch gehörten, bestanden normalerweise aus vier Sätzen—Gloria, Credo, Sanctus mit Benedictus und Agnus Dei—die durch gemeinsames Musikmaterial miteinander verbunden waren. Das Magnifikat wurde während des Abendgottesdienstes der Vesper gesungen. Votivantiphone waren Vertonungen von Andachtstexten, die nach dem Compline, dem letzten Gottesdienst des Tages, vor dem Bild oder Altar des Heiligen, an den der Text gerichtet war, gesungen wurden. Die kleineren liturgischen Werke waren ziemlich unterschiedlich, schlossen jedoch gewöhnlich Cantus planus-Sätze mit ein, die in der ‘Lady Mass’ (der besonderen Votivmesse der Heiligen Jungfrau) oder an besonderen Festtagen wie Ostern oder Weihachten gesungen wurden; häufig wurde die Cantus planus-Melodie, zu der der Text normalerweise gesungen wurde, in die polyphone Vertonung mit einbezogen. Während der 30er Jahre des 16. Jahrhunderts bestand die üblich e englische chorale Struktur aus fünf Stimmen : Diskant, Alt (normalerweise ‘Mittelstimme’ genannt), hoher Tenor, tiefer Tenor oder Bariton und Baß. Bei kleineren Chören oder bescheideneren Anlässen wurde möglicherweise drei—oder vierstimmige Musik verlangt. Offenbar wurde die stimmliche Polyphonie nicht von der Orgel begleitet, obwohl sie bei einigen polyphonen Stücken von Vers zu Vers mit dem Chor abwechselte; auch konnte sie den Chor bei der Aufführung des Cantus planus unterstreichen oder ersetzen, und sie wurde auf jeden Fall für freie Vor—und Zwisch enspiele verwendet. Andere Instrumente spielten scheinbar keine regelmäßige Rolle in der Aufführung von Kirchenmusik. Von den vier im vorigen Abschnitt erwähnten Musikkategorien ist lediglich das Magnifikat nicht auf dieser Aufnahme vertreten (obwohl Tallis’ vierstimmige Vertonung möglicherweise aus den 30er Jahren des Jahrhunderts stammt). Das Votivantiphon ist durch drei groß angelegte Werke vertreten, Ave Dei patris, Ave rosa sine spinis und Salve intemerata; die Messe durch eine kleiner angelegte Vertonung, die auf dem Salve intemerata aufbaut, und die liturgische Kategorie durch zwei Stücke aus der ‘Lady Mass’, Alleluia [Ora pro nobis] und Euge celi porta. Der Versuch, diese Werke zu datieren—oder gar in eine chronologische Reihenfolge zu setzen—wirft einige interessante Probleme auf, da sich das Beweismaterial der musikalischen Quellen manchmal von dem der Musik unterscheidet. Eine Chronologie, die allein auf dem musikalischen Stil aufbaut, würde die vier größeren Werke mit Sicherheit in die oben genannte Reihenfolge stellen. Das Ave Dei patris filia trägt starke Züge der Unerfahrenheit, das Ave rosa sine spinis gleicht dem Ave Dei patris filia weitgehend, wirkt jedoch etwas kontrollierter, das Salve intemerata ist auffallend besser geplant und kunstvoller geschrieben als die beiden anderen Antiphone und offensichtlich vor der daraus abgeleiteten Messe datlert. Das Quellenbeweismaterial rückt diese Schluß—folgerungen jedoch in ein zwei felhaftes Licht. Das Ave rosa sine spinis und das Salve intemerata sowie die damit verbundene Messe waren alle in einen Sammlung von Stimmpartien (Cambridge, University Library, Peterhouse MSS 471-4) enthalten, die etwa um 1540, in der Zeit, als Tallis dem Domchor beitrat, für die Kathedrale von Canterbury zusammengestellt worden waren; es kann durchaus sein, daß Tallis diese Werke selbst dem Kopisten zur Verfügung gestellt hat. Dagegen wurde das Ave Dei patris filia nicht in diese Stimmpartien mit aufgenommen und ist nur in spät eIisabethanischen und jakobälschen Quellen aus der Zeit nach dem Tode des Komponisten überliefert. Wenn es sich hierbei wirklich um das früheste von Tallis’ Votivantiphonen handelt, warum blieb es dann nur in sehr späten Quellen erhalten? In diesem Kontext könnte das Fehlen des Ave Dei patris filia in den für Canterbury kopierten Stimmpartien bedeutend sein. Vielleicht hat Tallis das Ave Dei patris filia nicht zum Kopieren weitergeleitet—vielleicht hat er sogar versucht, es zu unterdrücken — weil er es als eine Stundentenkomposition betrachtete, die für seine Reife nicht repräsentativ war. Die Datierung des Salve intemerata stellt ebenfalls ein Problem dar. Das musikalische Beweismaterial deutet darauf hin, daß es das späteste der in Frage stehenden Votivantiphonen ist, doch es stammt aus einer Quelle, die allgemein als die älteste mit Musik von Tallis betrachtet wird, ein einziges Stimmpartienbuch (London, British Library, Harley MS 1709), dessen übriger Inhalt eher auf die 20er als die 30er Jahre des 16. Jahrhunderts hinweist. Außerdem erschien der von Tallis vertonte Text zum ersten Mal gedruckt in einem 1527 veröffentlichten Stundenbuch. Man ist daher gerne versucht, die Komposition des Salve intemerata in den späten 20er Jahren anzusiedeln und das Ave Dei patris filia sowie das Ave rosa sine spinis zurück in die Mitte der 20er Jahre zu verlegen, um so den Reifeprozeß zu erklären, der scheinbar zwischen der Komposition dieser Werke stattgefunden hat. Die daraus erwachsenden Implikationen müssen jedoch durchdacht werden, da sie einige schwierige Fragen aufwerfen. Wenn Tallis Musik von dieser Qualität in den 20er Jahren komponiert hat, wa rum nahm er dann 1532 einer äußerst unwichtige Position in der Musikwelt ein? Warum hat sich seine Karriere so langsam entwickelt? Warum trug er bei seinem Umzug nach Canterbury im Jahr 1540 nur drei Werke zu der Sammlung an Stimmpartien bei, die zu der Zeitgerade für die Kathedrale zusammengestellt wurden? Wenn wir anhand des vorliegenden Musikstils die Schlußfolgerung akzeptieren, daß die vier großen Werke auf dieser Aufnahme in der Reihenfolge Ave Dei patris, Ave rosa sine spinis, Salve intemerata, gefolgt von der Messe Salve intemerata komponiert wurden, müssen wir fast notgedrungen den Rück schluß ziehen, daß Tallis’ Karriere als Komponist in den 30er Jahren anstatt den 20er Jahren des 16. Jahrhunderts begonnen hat. Seine Stelle als Organist des Dover Priory ist für einen jungen Mann an der Schwelle einer musikalischen Karriere angemessen; der Umzug nach London spricht für einen etwas erfahreneren, aber immer noch nicht etablierten Musiker, der sich größeren Herausforderungen und Möglichkeiten, aber auch weniger Sicherheit gegenübergestellt sah; der Posten an der Waltham Abbey scheint ihm eine gehobene Stellung und vielleicht eine Rückkehr zur Sicherheit geboten zu haben; die Umzüge nach Canterbury und zur Chapel Royal markieren einen weiteren Aufstieg auf der professionellen Rangleiter. Wenn diese Hypothese richtig ist, kann es durchaus sein, daß Tallis fünf Jahre später als allgemein angenommen geboren wurde—etwa um 1510 anstatt um 1505. Jeglicher Versuch, diese Kompositionen mit bestimmten Phasen von Tallis’ früher Karriere in Verbindung zu bringen, muß notgedrungen Spekulation bleiben. Die offensichtliche Unreife des Ave Dei patris filia führt zu der Überlegung, daß dies Werk möglicherweise während der Jahre im Dover Priory komponiert wurde. Diese Unreife des Ave Dei patris filia kommt auf verschiedene Weisen zum Ausdruck: die melodische Komposition ist verhältnismäßig ziellos, unausgewogen und in konsequent, sie enthält nur wenig von der Schärfe, die wir mit Tallis verbinden; die internen Proportionen sind nicht immer überzeugend, vor allem bei den häufigen Abänderungen der Textur gegen Ende des Stückes; die Komposition mancher der Stimmen ist ziemlich ungeschickt. Außerdem bestehen einige bemerkenswerte Ähnlichkeiten in der rhetorischen Geste, der Partiturierung und sogar dem musikalischen Material zwischen Tallis’ und Robert Fayrfax’ Vertonung dieses Textes—es scheint fast, als wolle Tallis sein Werk auf einer anerkannten Vorlage basieren. Fayrfax, der 1521 starb, galt offenbar als der größte Komponist seiner Zeit, und seine Vertonung des Ave Dei patris filia war eines seiner populärsten Werke—de facto genau die Art von Arbeit, die jeder lernende Komponist als Vorlage wählen würde. Dies soll jedoch nicht heißen, daß wir Tallis’ Ave Dei patris filia keine Aufmerksamkeit schenken sollten. Das Werk hat einen eigenen Charakter— vor allem zeigen sich bereits die Qualitäten der Nüchternheit und Beherrschung, die Tallis’ spätere Musik in so hohem Maße durchdringt. Auch gibt es uns die seltene Gelegenheit, einen Komponisten aus der frühen Tudorzeit beim Erlernen seiner Kunst zu beobachten. Bis vor kurzem galt das Ave Dei patris filia als unaufführbar, da es in einem sehr unvollständigen und korrupten Zustand überliefert ist: große Teile der Diskant—und Tenorstimmen fehlen, und in einigen Quellen ist die Musik scheinbar in modernisierter Form festgehalten, die eher dem Geschmack der Jahre um 1600 als um 1530 entspricht. Die in dieser Aufführung verwendete Ausgabe ist einer von zwei vor kurzem veröffentlichten Versuchen, das Werk so weit wie möglich in seinen Originalzustand zurückzuversetzen. Das Ave rosa sine spinis ist dem Ave Dei patris filia sehr ähnlich, nur daß der Komponist selbstsicherer ist. Die melodische Komposition wirkt logischer und zielsicherer, die Komposition der einzelnen Stimmen weniger holprig, und Form und Tempo des gesamten Werkes scheinen weitaus erfolgreicher. Während das ‘Amen’ des Ave Dei patris filia fast wie ein flüchtiger Nachgedanke klingelt, bildet das des Ave rosa einen sehr wirkungsvollen und gut durch gezogenen Höhepunkt. Wie das Ave Dei patris filia ist auch das Ave rosa unvollständig überliefert. Allerdings fehlt hier weitaus weniger: das einzige, das hinzugefügt werden muß, ist die Diskantstimme in dem Duett für Diskant und Baß, beginnend mit ‘Benedicta tu in mulieribus’. In dieser Aufnahme wird das Ave rosa so von fünf Solostimmen gesungen, wie es möglicherweise im Dover Priory aufgeführt wurde. Das Ave Dei patris filia und das Ave rosa sine spinis gleichen einander nicht nur in ihrem allgemeinen Stil, sondern auch in ihren Texten—relativ banale Herzensergüsse an die Heilige Jungfrau, wie sie nur allzu häufig im Votivantiphon der frühen Tudorzeit zu finden sind. Der Text des Ave Dei patris filia besteht einfach aus einer Reihe abgedroschener Huldigungen der Jungfrau, die mit einer Bitte um ihre Fürsprache enden. Der Text des Ave rosa ist etwas anspruchsvoller, eine Erweiterung des ‘Ave Maria’, in der jedes Wort oder jede Phrase des Ursprungge bets— ‘Ave’, ‘Maria’, ‘gratia plena’, ‘Dominus tecum’ usw.—jeweils den Anfang einer Strophe des Gedichts bildet. Der Text des Salve intemerata ist dagegen etwas ganz anderes—es handelt sich hierbei um ein ziemlich langes, kompliziertes und sorgfältig durch dachtes Prosagebet an Maria. Andachtstexte dieser Art, die an Maria oder Jesus gerichtet sind und eine hartnäckige Dialektik besitzen, scheinen in den 30er und 40er Jahren des 16. Jahrhunderts bei m anchen englischen Komponisten—oder ihren Schirmherren—sehr beliebt gewesen zu sein. Taverners Gaude plurimum und O splendor glorie sowie Ludfords Domine Jesu Christe sind vergleichbare Texte, die von zwei älteren Zeitgenossen Tallis’ vertont wurden, und Domine Deus celestis wurde von einem etwas jüngeren Mann, Christopher Tye, vertont. Das Salve intemerata ist genau die Art von Text, der Tallis eher in London als der konservativeren Atmosphäre von Dover oder Waltham begegnet sein muß. Wir können durchaus annehmen, daß das 1527 veröffentlichte Stundenbuch, in dem der Text zum ersten Mal erschien, Tallis auch noch zehn Jahre später zur Verfügung stand, und die Sammlung an Stimmpartien, zu dem das Harley 1709 gehörte, auch noch in den späten 30er Jahren benutztwurde. Die Vertonung des Textes von Salve intemerata muß für einen Komponisten aus Tallis’ Generation mit Sicherheit eine einschüchternde Herausforderung gewesen sein. Da er in Prosa gehalten war, bot er weder eine Strophenstrukur noch ein Reimschema, das der Komponist in seine musikalische Konstruktion mit einbauen konnte; sein Wortreichtum und seine Rhetorik verlangten eine prägnante und eindrucksvolle Vertonung; seine Spitzfindig keit und sorgfältige Argumentation erforderten eine Musik, die sowohl aufhellend als auch ausschmückend war. Tallis’ Leistung im Erfüllen dieser Herausforderungen ist erstaunlich. Die Musik ist ebenso genau durchdacht wie der Text und offenkundig in Anpassung an dessen rhetorischen Zweck gestaltet. Zwei Techniken der Komposition—Nachahmung und motivische Komposition—leisten einen besonders bedeutenden Beitrag zu dieser fesselnden musikalischen Argumentation. Die Nachahmunng, zu der das Weiterleiten musikalischer Einfälle von einer Stimme zur anderen gehört, erweckt den Eindruck, als diskutierten eine Gruppe von Leuten ein Thema; es ist bemerkenswert, wie Tallis dahin tendiert, alle Stimmen mit Ausnahme der nachahmenden Stimme melismatisch zu gestalten, so daß die textierte Stimme noch stärker aus der Textur hervortritt. Motivische Komposition, die das Erzeugen melodischer Linien aus ständig wiederverwendeten und subtil abgewandten Komponenten erfordert, schafft den Eindruck eines sich entwickelnden Gedankenganges, was dem hier vertonten Text äußerst angemessen ist. Wenn einige Kommentatoren behaupten, daß Tallis im Salve intemerata zu diszipliniert und eingleisig und zu geflissentlich auf die Zurschaustellung seiner Fähigkeiten bedacht sei, so unterschätzen sie die Überzeugungskraft dieses groß angelegten Werkes und dessen Bedeutung für Tallis’ eigene musikalische Entwicklung. Wenn die vierzig stimmige Motette Spem in alium Tallis' musikalischer Everest war, dann war Salve intemerata sein Matterhorn. Tallis’ Messe Salve intemerata baut eng auf seinem Votivantiphon auf. Die Beziehung zwischen den beiden Werken ist besonders eng im Gloria, dem Tallis kaum neues Material hinzufügt, sondern lediglich rhythmische Änderungen in Anpassung an den neuen Text vornimmt. Die anderen Sätze bewegen sich immer weiter von dem Material des Antiphons fort, so daß etwa ein Viertel des Credo, ein Drittel des Sanctus und die Hälfte des Agnus Dei frei komponiert sind. Obwohl die Tenorpartie der gesamten Messe fehlt, kann sie mit Sicherheit an den Stellen rekonstruiert werden, an denen die Messe das Antiphon zitiert, da das Zitat wörtlich ist; die frei komponierten Teile bieten mehr Spielraum, doch Tallis’ Vorliebe für die nachahmende Komposition ist für den Restaurator oft sehr hilfreich. Die Idee, eine Messe unter Wiederverwendung der Musik einer bereits existierenden Komposition zu schreiben, war nicht neu—Fayrfax hatte dies eine Generation früher in seinem Votivantiphon und der Messe O bone Jesu versucht—doch es schien in den 30er Jahren des 16. Jahrhunderts ein erneutes Interesse dafür aufzukommen. Tallis’ unmittelbaren Vorlagen waren wahrscheinlich Taverners Messen Mater Christi und Small devotion/Sancti Wilhelmi, die der Komponist von seinen eigenen Votivantiphonen Mater Christi und Christe Jesu abgeleitet hatte, doch in einer Hinsicht war Tallis weitaus kühner als Taverner. Während Taverner sein Material in einen im wesentlichen ähnlichen Kontext erneut anwandte, zeigt Tallis’ Wiederverwendung seines Materials dieses in einem radikal neuen Licht: während es sich beim Antiphon um ein groß angelegtes öffentliches Werk handelt, ist die Messe knapp und intim. Tallis paßt die bereits existierende Musik geschickt an ihre neue Umgebung an, und seine Verquickung des alten Materials mit dem neuen ist äußerst bemerkenswert, insbesondere deshalb, weil dies so unauffällig geschieht—seine Kunstfertigkeit ist von höchstem Rang. Die anderen beiden polyphonen Werke auf dieser Aufnahme tragen ziemlich andere Charakterzüge. Es handelt sich hierbei um vierstimmige Vertonungen von wä h rend der ‘Lady Mass’ gesungenen Cantus planus-Teilen. Alleluia [Ora pro nobis] ist das in der ‘Lady Mass’ an Dienstagen von Mariä Reinigung bis Advent gesungene Halleluja. Tallis vertont nur das chorale Alleluia und setzt den Cantus planus in monorhythmischer Form in die zweithöchste der vier Stimmen; das eröffnende Alleluia und der Vers Ora pro nobis wären von Solisten im Cantus planus gesungen worden. Euge celi porta ist der zweite Vers der Sequenz Ave preclara maris stella, gesungen in der ‘Lady Mass’ an Sonntagen (und auch an der Oktave von Mariä Himmelfahrt); hier wird der Cantus planus in verzierter Form in der Tenorstimmegesungen. Möglicherweise hat Tallis ursprünglich Musik für alle Verse mit geraden Zahlen komponiert, so daß eine vollständige liturgische Aufführung zwischen Polyphonie und Cantus planus oder Orgel abgewe chselt haben würde. Beide Stücke sind nur in den Stimmpartien der Gyffard—Sammlung (London, British Library, Additional MSS 17802-5) überliefert, die aus Königin Marys Regierungszeit stammen, doch aufgrund ihres Stils einer frühen Phase in Tallis’ Karriere zu angehören scheinen. Das Alleluia klingt in der Tat mehr nach Taverner als nach Tallis, und beide Stücke enthalten einige überraschende Klänge, die möglich erweise auf eine ungenaue Abschrift zurückzuführen sind.